The book is, interestingly, not organized by the printing technique or by the type of material owhich gets decorated. The astonishing variety of the projects come as a bigger surprise in the book organized by... the motif type. Thus, it starts with abstract and geometric shapes, through everyday patterns, occasions and celebrations, flora and fauna, to travel inspired motifs. At the same time, I feel like the projects are organized from the easiest to the more involved. Each project is described in step-by-step instructions, well illustrated and easy to follow, if you decide to use the book as the handbook. To make it easy, one of the appendices contains all the templates, which you can use if you want to decorate your home with exactly same patterns as shown on pages of "Make it yours". Now, if you think that using patterns templates is cheating? Perhaps, so just draw your own! You can use the book just as a source of inspiration. To help you create your own projects, another appendix provides a comprehensive list of supplies and additional details about techniques and some basics of design. 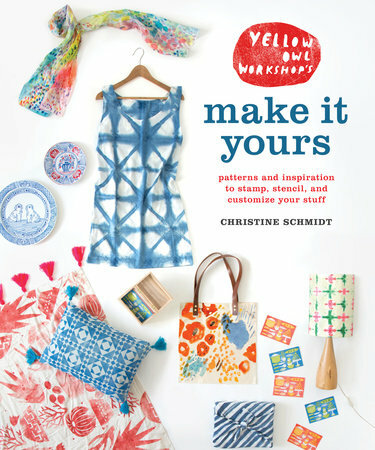 The projects in "Make it yours" vary from golden decorated dresser, to tote, scarfs and other garment, stationery - all the way to decorating a cake with chocolate. The interesting range of project has one thing in common, putting personal touches on ordinary everyday objects. Considering that the patterns can then be applied to fabrics, leather, paper, wood, ceramics, even cakes- there is some great variety here! My favorite part of the book? The designing logo tips in the project "logo stamp". I would rather use the book as the inspiration than follow strict outline, so this chapter helps organize the thoughts and design something really personal and mine. I would strongly recommend it to anybody thinking of doing some crafts, maybe during long evenings this upcoming winter!